LP SmartSide, an engineered lap siding brand manufactured by LP Building Products, was created from wood strands and then coated with a wax for moisture resistance and then bonded with resin and other materials, offering the beauty of natural look, but with more durability for a fraction of the cost. The proprietary SmartGuard® manufacturing process, according to the company, helps the product resist termites and fungal decay, all while being backed by an industry leading 5/50-year limited warranty. How much does LP SmartSide siding cost per square foot? The costs of LP SmartSide will depend on the product purchased, where it’s purchased, and in the case of hiring a professional — the scope of the project and your geographical region. For the products, including the siding and the trim accessories, the costs tend to fall in the $2 to $4 a square foot range, whereas professional installation, based on the factors, can range anywhere from $4 to $9+, bringing the total cost to $6 to as much as $13+ per square foot installed. This is the price of a basic install and will not include additional materials such as trim pieces, soffits, paint, etc. As there can be so many factors, it can be hard to offer an exact estimate, and for that reason, we highly encourage you to try out HomeAdvisor.com, a free quote tool which allows you to gather quotes from locally licensed contractors via your email or over the phone, whichever you prefer. No credit card is required and it’s considered a great way to compare the quotes in your area to ensure you’re paying a fair price. Roofingcalc.com, for example, in its comparison to HardiePlank siding, noted the total costs of an install can range anywhere from $5.35 to $11.75 per square foot based on their estimates, with most homeowners seeing an 82 to 87 percent return on their investment. To see what the materials cost without professional installation, you can do so via the Home Depot website, for instance. Here, when we glanced at the options, a 48 by 96-inch panel siding piece would retail for $22 to $35 each. At Menards, 3/8″ by 12 to 16 foot long pieces ranged anywhere from $5 to $10 each, whereas the panels, similar to that offered at Home Depot, were in the same price range. Again, these were the prices for just the materials and would not include professional installation costs. 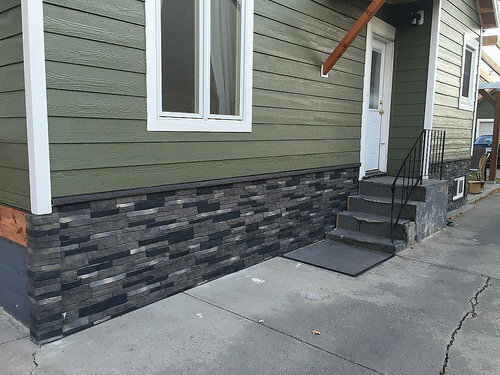 The siding is manufactured in six various styles: cedar texture lap, cedar texture shakes, 12” bold double-lap and triple-lap profiles, 16” double/triple/quad profiles, colonial beaded and smooth. In comparison to other siding providers in the industry, the company offers a different program that allows qualified pre-finishers to put on a finished coat on the final product, meaning it can come in a variety of colors, according to the company. Head to the official website for more details.